STORE: ripe pluots in the refrigerator for up to three days. PREP: If stored in the refrigerator, remove your pluots before eating and let them return to room temperature. They taste much better this way. Rinse and leave whole, slice into wedges or cut into chunks. USE: These sweet Dapple Dandy Pluots can be eaten out of hand, as a fresh topping for yogurt, dehydrated into dried pluots or made into jam. You can also experiment by substituting them for plums in recipes (after all, they are the delicious hybrid of the plum x apricot). Larger globe eggplants should be peeled and salted before cooking. To peel, use a small knife or peeler and cut off the skin in stripes, leaving some of the peel still intact to help hold its shape when cooking. Then cut into slices or cubes. The most important step is to “sweat” the eggplant. This helps in getting the best flavor and consistency (helps it not be bitter). Do this by tossing in a generous amount of salt and leaving in a colander for about an hour, then squeeze dry. Rinse well under cold water and completely dry by squeezing them between a towel. To cook you can grill, bake or sauté. The eggplant soaks up lots of flavor from the olive oil and balsamic vinegar, and the caramelized onions add a touch of sweetness. Toss it all together with chewy quinoa and you’ve got a satisfying whole-grain salad to enjoy! Place a rack in the center of the oven and preheat to 425°F. To prepare the quinoa, add the water, quinoa, bay leaf, and dried chile to a 2-quart heavy saucepan and bring to a boil. Decrease the heat to maintain a simmer, cover, and cook until the grain is tender with a slight chew, 20 to 25 minutes. Remove the bay leaf and chile, drain if needed, and transfer to a large serving bowl. Sprinkle with the minced chile, Aleppo pepper, and dried mint and toss to combine. Meanwhile, to make the salad, place the eggplant and the onion on a large rimmed baking sheet. Drizzle with 2 tablespoons of the olive oil, sprinkle with the salt, and combine well, using your hands. If you don’t mind the extra dish, it’s a bit easier to toss everything in a large bowl. Roast the mixture until the eggplant pieces have softened and are browned in spots, and the onion slices have caramelized, turning them once with a spatula in between, 30 to 35 minutes. Remove the baking sheet from the oven and immediately sprinkle the vegetables with 1/4 cup of the fresh mint and drizzle with 1 tablespoon of the vinegar. Toss well with a spatula — this will soften the mint leaves and take the sting out of the vinegar. To finish, add the warm eggplant mixture to the quinoa. Drizzle with the remaining 2 tablespoons olive oil and 1 tablespoon vinegar and toss to combine. Season with salt and vinegar to taste. Top with the remaining 1/4 cup mint and the pine nuts and serve. Actually, I am looking for a good rain to clean the air and end the fire season early or at least allow a respite for all the fire crews and families directly impacted by all the forest fires. And for the rest of us breathing this smoke, it would be most appreciated too. Lord, please send the rain. Last week, Joelle and I and a few of the kiddos snuck off to Moclips for a few days before soccer starts, school begins and the final push to the Fall farm season. Fortuitously, it also happened to have the best air quality in the state, not great but not above 100 either. We just played at the beach. The waves just kept coming and coming and coming! Awesome power and rhythmic. When all was quiet during the wee hours of the morning, (I might be on a vacation, but I still get up at 5am) you could hear the constant roar of the ocean, like a freight train, but it is never accompanied by a crossing signal or the faint coming or going of a train. What power, magnificent power! Most of us reading this newsletter, appreciate the tide coming and going as it pertains to the Puget Sound of Salish Sea. And for sure the sound can be very stormy, but it is a tame beast compared to the Pacific Ocean. We wandered out into the Griffiths-Priday state park and waded the quiet waters of the Copalis River. We made our way to the mouth of the river, a completely different experience than the Stillaguamish and Skagit Rivers. There we came across the biggest hoof prints I have ever seen. Definitely not coastal black tail, or horses, they belonged to an elk. I guess Elk Creek was appropriately named after all! The tracks were huge, and the gait had to be 6 feet between hoof prints. We followed the tracks in the wet sand till it crossed back over the Copalis River and though we searched and searched, we couldn’t find the tracks on the other side of the river. But it was fun to look and since we are on vacation and no need to be anywhere at the moment, looking was perfectly acceptable. Nature is beautiful. It is beautiful at the ocean, and in the city and on the farm. There is so much intricacy on a centipede or a robin or skate. Leaves floating above the water and leaves jostling below the water both making their way to the ocean or the bottom, but both destined to rejuvenate the ecosystem. It is a privilege to participate actively or passively with nature and all its wonder. Apples are one of those quintessential healthy eating choices! You can dice them up and throw them into your hot cereal with some cinnamon for a fresh take on breakfast, toss them in smoothies, slice them atop green salads to sweeten them up and add texture, dip them in nut butter or yogurt for a snack, roast with savory fall veggies, bake with a topping of your favorite granola…so many ways to enjoy them! And perhaps the best part? Antioxidants and phytochemicals in apples have been linked to help prevent a number of chronic diseases, including: Alzheimer’s, lung cancer, heart disease, breast cancer, diabetes and more. Store unwashed apples in the coldest part of your refrigerator. Be sure to store separately. See healthline.com for more nutrition information on Apples! You’ve no doubt seen frisée before, perhaps without realizing it, tucked away inside a mesclun baby greens mix. Also called curly endive, the curly, pale green leaves are frizzy in appearance. Frisée is a variety of chicory, as you’ll be clued in to with the first solo bite: it’s one of those bitters we were talking about in last week’s newsletter. Store: in the fridge for up to five days (rinse first), in plastic or other non-breathable material, so it doesn’t wilt. Use: most often served fresh in salads, try it wilted or sautéed to mellow its bitterness. Frisée pairs well with flavor-packed ingredients and fats: Dress leaves with a warm vinaigrette of roast-chicken pan drippings and sherry or red wine vinegar, toss in browned bits of thick-cut pancetta, ham, or steak bits, or top with a poached or fried egg. This dish combines all of those wonderful summer veggies with a creamy, yet light, dressing that is full of flavor. This version has cooked chicken, but this salad can certainly be served on its own. Likewise, feel free to swap in your favorite vegan dressing if dairy isn’t in your diet. Serves 3-4. If you are starting with uncooked boneless chicken breast, preheat your oven to 400 degrees. Brush the chicken with olive oil on both sides and sprinkle with salt and pepper. Place in a baking dish and roast for 15-20 minutes until cooked though. The internal temperature should be 165 degrees. Let cool and either slice into thin strips or shred with a fork. In a large bowl combine the summer squash, bell pepper, tomatoes, frisée, green onions, corn, cucumber, and shredded chicken. In a small bowl combine the buttermilk, mayonnaise, Greek yogurt, cilantro, garlic, lime juice, salt and pepper. Pour the dressing over the salad. Combine well. Serve at once. While the pasta cooks, combine the garlic, olive oil, the 1 teaspoon salt, and red pepper flakes in a large skillet and warm over low heat, stirring occasionally, until the garlic softens and turns golden, about 8 minutes. Drain the pasta in a colander set in the sink, reserving about a 1/4 cup of the cooking water. Add the pasta and the reserved water to the garlic mixture. Mix well. Add in the cherry tomatoes and frisée. Add the parsley and lemon zest (if using). Adjust seasoning, to taste. Transfer to a large serving bowl or divide amongst 4 to 6 dishes. Serve topped with grated cheese, if desired. August. What does it bring to mind for you? Perhaps it is harvests: long, seemingly never-ending harvests. Or maybe it is water: the drips we give our thirsty plants, or the lakes, ponds, streams and rivers in which we cool our over-heated bodies after a long day in dusty fields. Certainly, August embodies the Sunday Syndrome of summer: although the season is not yet over, we already begin to look past it to what the next has to offer. This strange, hot month offers us a respite – a needed breath of air before plunging in again for cool, abundant autumn. I have always appreciated how the poet Helen Hunt Jackson described this month in her poem of the same name: an “interval of peace” in which “all sweet sounds cease, save hum of insects’ aimless industry.” It truly is a pause – a greatly needed one – in which our plants are finally at stasis, if only briefly, and we can at last sneak away for an afternoon or an evening to do nothing but perhaps listen to the hum of aimless insects and recharge the wellspring for the final push of summer. Farmer or not, those words aptly describe what most of us are experiencing. Our farm is at that spot, plantings have slowed, summer harvest is going strong and weeding is mostly caught up. Fall is often busier than Spring and ironically, what went into the ground as a seed in June is now coming out by the ton. My attention is definitely on Fall crops, like making sure to pick the apples before they fall! That doesn’t always happen, but when one drops, the rest are not far behind. Corn, winter squash and pears are not far off either and then there is the last plantings of garlic, winter kale, frisée, and Radicchio’s to be planted. We will also be planting cover crops to feed the soil and protect it from the compaction of winter rains. I am tired just thinking about it all, but at the same time I am energized to see it through to completion. For the tired farm crew. These are easy to tell when ripe because they brighten in color (turn from green to yellow in tone) and have a wonderful fragrance. Try adding pears to a salad this week! Cut into wedges or cubes they would make a great addition to this week’s salad mix. For dressing, try mixing a tablespoon of balsamic vinegar with a little bit of Dijon mustard and about an eighth cup of maple syrup. Mix together with a wire whisk and beat in an eighth cup of olive or avocado oil. I would probably double the recipe if serving more than 3 people. Can also be topped with gorgonzola, feta, or goat cheese and pecans (or walnuts). If you don’t have time to roast or boil beets you can shorten the cook time dramatically by slicing off thin rounds and either sautéing, steaming, or boiling them, just peel them first with a vegetable peeler. In the cooking world, beets are often referred to as “nature’s multivitamin” for their incredible range of vitamins, minerals and antioxidants. Although beets can be cooked in a variety of ways (including as a secret ingredient for deep dark chocolate cake-Google it! ), roasting beets is one of the easiest and most delicious. Roasting beets intensifies their flavor, brings out their earthy sweetness, and makes their skin tender and easy to peel off. Roasted beets are particularly delicious in beet salads or just as a complementing side dish. Kale is just wonderful and it’s so good for you! One great thing about kale as a salad is that it keeps well in the fridge, so you can make ahead of time and not worry about it wilting. Kale can be a little tricky because it tends to be a bit tough and sometimes bitter. Here are a few tips that have helped me. First make sure to remove all large ribs and stems (They make a great addition to a stir-fry though! ); Chop the leaves small; Sprinkle with salt to cut the bitterness; “Tenderize” the leaves by massaging them with your hands (only takes about half a minute); And lastly, massage in the olive oil or salad dressing. This turns the kale bright green and makes it so it’s evenly covered. For the dressing, I like to use a combination of vinegar and olive oil. Once you have prepped your kale and worked in the dressing, add your toppings. Try with apple or pear slices. Cashews, almonds and dried cranberries also taste great with this combination! Pass the broccoli! Broccoli contains plant compounds which protect against cancer. Broccoli is great in salad, stir-fry, soup, roasted, steamed, or raw with your favorite veggie dip. Add Broccoli to your next box of good food delivery here. The high heat with this method causes the broccoli to caramelize making this one of the tastiest ways to prepare and eat broccoli. Leave off the pecorino for a vegan option (try topping with a drizzle of tahini instead). Serves 3-4. Preheat the oven to 475 degrees Fahrenheit. If you prefer less crispy florets (or if your oven runs hot), you can reduce the oven temperature by 10 to 15 degrees Fahrenheit and adjust cooking time as necessary. Line a sheet pan with parchment. Trim any dry, tough ends of the broccoli crowns, leaving roughly 2-inches of stalk attached. Slice the broccoli into ½-inch-thick steaks, starting in the center of each broccoli crown and working out to the edges, reserving any small or medium florets that fall off for roasting. Slice any large remaining florets in half lengthwise. In a large bowl, whisk together the olive oil, pressed garlic, and red pepper flakes. Add the broccoli steaks and toss gently until evenly coated. Arrange the broccoli, cut-side down, on the lined sheet pan, setting them apart slightly. Sprinkle with salt. Roast the broccoli for 10 to 12 minutes. Remove the pan from the oven, flip the broccoli, and sprinkle the almond slices evenly across the sheet pan. Roast for an additional 8 to 10 minutes, or until the broccoli is evenly caramelized and fork tender, and the almond slices are toasted and golden. Transfer the broccoli to a platter, toss gently with the lemon juice and top with the grated pecorino cheese. Garnish with fresh lemon zest. Serve hot or at room temperature (it also tastes great cold). Leftover broccoli can be stored in an airtight container in the fridge for up to 2 days. I love what we do. I love that our team gets to grow, source, and deliver health. I love that everything we deliver is better for your heath and better for the environment. For the last twenty years we have been offering nutrient rich fruits and vegetables to families like you every single week. That is a long run! Many of you reading this newsletter have been a customer for a decade or more and more than a few of you have been customers from the beginning since 1998. For us, doing business is more akin to serving our neighbors. We want everyone to eat healthy and be healthy. We want each of you to have access to the freshest and healthiest foods to nourish your body and provide energy to accomplish everything on your to do list – everyday! I firmly believe that health and health care start at the farm and our forks. When we choose a diet rich in organic fruits and vegetables, our bodies tend towards a normal weight as does our A1C, lipid panels and blood pressure. We also introduce a lot of antioxidants into our bodies that just love to tie up damaging free radicals. The other day I saw this ad in the Everett Herald – “Ready to Get Healthy”. There was a picture of a smiling obese person. The sub text said, “Sign up to attend a free seminar on Bariatric surgery.” To be perfectly clear, Bariatric surgeries can work, but so can sewing your jaw shut! Our stomachs are about 1 liter in size. That is not very big and to go through an intense and invasive surgery to limit our ability to overeat seems extreme. I think it would be better for insurance companies to invest the thousands of dollars that this surgery costs and spend it on a one month stay at a health clinic where a person could get educated about a healthy diet, be fed a healthy, primarily plant-based diet and given an appropriate exercise regime – all monitored. The same money would produce better, less intrusive results and would impact other people in the immediate family and circle of friends. Of course, the FDA and USDA could just require purveyors of junk food to pay for the medical bills out of their obscene profits instead of expecting the taxpayers or insurance companies to pay for the medical costs as they use their profits to sicken more. Or, the USDA and FDA could just ban known junk food that is contributing to the health crisis, but don’t hold your breath for these changes. Unfortunately, legislating health is not likely, but we get to choose health one bite at a time, 3x’s a day. Even having just one salad a day can have immense health benefits. I also want to share that is both hard to eat healthy and easy to eat healthy. So, where ever you find yourself on the continuum of eating healthy or being healthy, that is where you are. You can’t change that. You can’t go backward, only forward. So today, tonight, pick up that fork and make a healthy choice and another and another. The culmination of all of us saying yes to healthy food will have a powerful impact on our personal health, our family’s health and eventually our Nation’s health. Storage and Eating: They may look hardy, but melons can perish quickly if not kept in the refrigerator. Keep ripe melons away from other fruit so that the ethylene gas that they produce does not speed up the fruit’s ripening. Uncut ripe melons should keep in the fridge for up to 5 days. You can also use a melon baller to scoop out ripe fruit and then freeze to add to smoothies. Eat it: Cabbage is a handy thing to have around. There are endless opportunities to use it up. You can add it to “just about anything” veggie-wise. Make cabbage “shavings” by first cutting the cabbage in half, then simply shaving off pieces from along the edges. Also, if you’re like me and rarely use a whole cabbage in one sitting, keep the cut edges from drying out by rinsing and storing in a sealed plastic bag. This delicious, filling comes from the one by Dr. Joel Fuhrman. This combination of greens, seeds and currants will fill you up quickly and keep you full. In a high-powered blender, blend almond/hemp milk, apple, cashews and vinegar and toss with salad. Garnish with currants and lightly toasted sesame seeds. When I was younger I thought I had the “tiger by the tail.” I had unlimited amounts of energy and ideas and was constantly moving and doing. But now I have a little more seasoned appreciation for life and where to invest my limited energy and unlimited ideas. We have chosen to stay small, local and control our own deliveries. It is an important distinction that we control so much of our offerings. When your name is on the Box of Good, you want it to be as perfect as possible. “Mr. Klesick is a passionate person” or “He cares about the big picture.” These sentiments come across my desk quite frequently. It stems from my desire to bring you the freshest and healthiest organic fruits and vegetables because the freshest and healthiest vegetables are what fuel our bodies to serve our families, friends, and communities. Eating is important as is eating the best of the best and that is what the Klesick team tries deliver to you every week. I also believe that Americans and the world are eating less vegetables and fruit and less diversity of vegetables and fruit. Consequently, these important nutrients are missing in a majority of Americans’ diets. Sadly, they are being replaced with more shelf stable and processed foods. I firmly believe that if Klesick’s is going to be a part of the solution to America’s nutritional crisis and the host of maladies that come from eating a diet low in vegetables and fruit, our boxes of good need to have a diversity of fruits and vegetables to maximize our health. This is no easy task because all of us have different taste buds and all of us to one extent or another have been “tricked” by our taste buds (or corporate America), to prefer sweet and salt and not the subtle taste profiles of greens or plums. For me, I use a “crowd out” strategy to eat healthy. On my plate I “crowd out” room for the more processed foods by filling my plate with a lot of vegetables and fruit. It takes a while to get use to eating this way, but by leading with the healthier fruits and vegetables my body says, “thank you.” And this body is the tool that I get to use to serve my Lord, my family, my community and you! I want to be as healthy as I can, so I can serve others as long as I can. Your plums will continue to ripen once off the tree. Simply leave them on the counter away from the sun. When ripe, store unwrapped in the refrigerator for up to three days. If stored in the refrigerator, remove your plums (same goes for pluots) before eating and let them return to room temperature. They taste much better this way. Rinse and leave whole, slice into wedges or cut into chunks. Use them as a fresh topping for yogurt, dehydrated for fruit snacks or make into jam. Store tomatoes in a single layer at room temperature and away from direct light. Refrigerate only after slicing, as refrigeration makes tomatoes lose their flavor. Romas are great for cooking (especially soups and sauces) as they don’t have the seeds and excess water that many other tomatoes tend to come with. You can also eat them raw, roasted, fried, or broiled; they are great paired with a little olive oil and salt, herbs such as basil and cilantro, and fresh cheeses such as mozzarella and ricotta. And yes, you can totally freeze those extra tomatoes for fresh flavor all year (slice first). 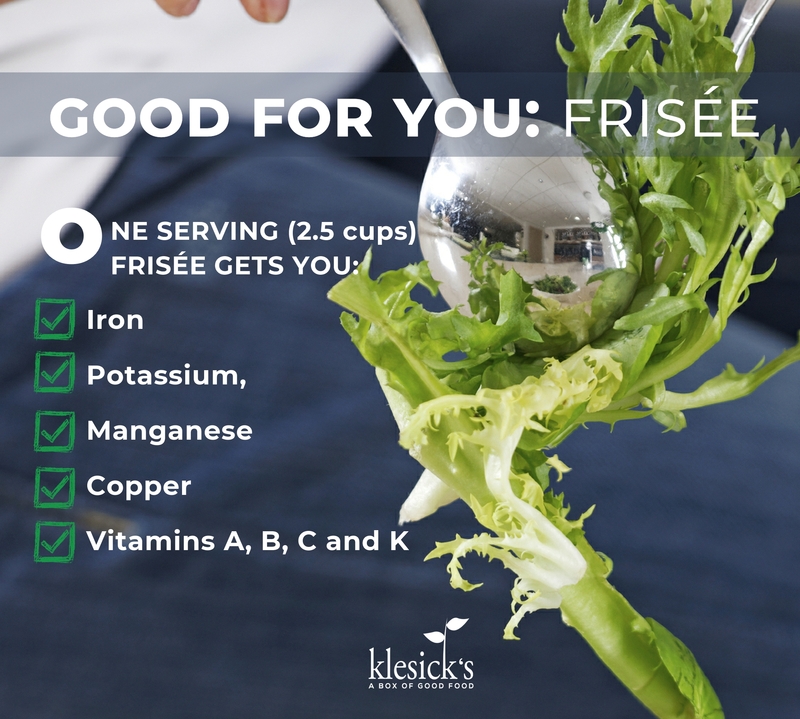 Check out more great info on Frisee from the front page of this week’s newsletter, HERE. Put a large pan of salted water on medium high heat. Rinse the green beans and cut of the stem of each bean. When the water boils add the green beans and cook them just until al dente. Rinse with cold water and let them cool. Wash and dry the frisée and divide over 4 plates. Cut the tomatoes and eggs in wedges. Divide onion, cooled green beans, artichoke hearts, olives and eggs over the frisée. Divide the tuna (or salmon) chunks and anchovy fillets over the plates and serve with a lemon wedge.